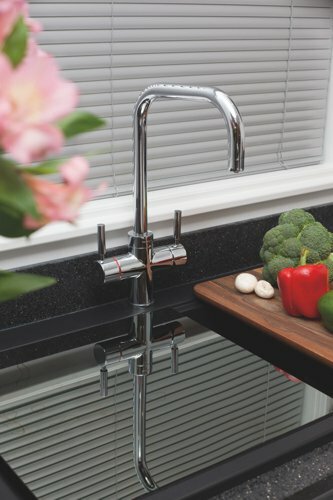 The TV14WH is a modern kitchen tap featuring a stylish supporting arm bar, single lever, 360° spout rotation and a white pull-out spout, giving you greater flexibility when trying to complete kitchen tasks. The TC55 monobloc chrome tap has a swan neck spout with dual flow. The tap has a ceramic disc valve which is low maintenance and hard wearing water tight seal with easy quarter turn operation. 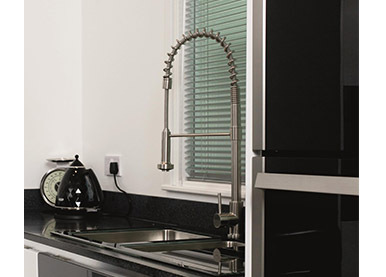 The TC56 monobloc tap with pull-out spray brings extra flexibility when trying to complete kitchen tasks including being able to reach further than the sink, while being able to control and direct the spout in one hand. The TC65 monobloc tap with quad spout has a chrome design with a dual flow. The tap has a ceramic disc valve which is low maintenance and provides a hard wearing, water tight seal. Taps can be anything from functional and every day to technical, professional or even a modern sculpture in its own right. We have included models for any style of kitchen, from the traditional TT56 bridge tap that is designed to look perfect alongside a Belfast sink to the professional kitchen style TM30 coil tap with a pull out spray that is just like the models you would see in a top restaurant kitchen. Instant hot water for drinks and for cooking is a convenience more and more UK consumers are choosing when buying a new kitchen. CDA has launched the TH101CH and TH101BR three in one instant hot water tap with a unique heating system that will allow cup after cup of hot water to be dispensed before reheating is required. Water is delivered at 98°C – the perfect temperature for hot drinks. 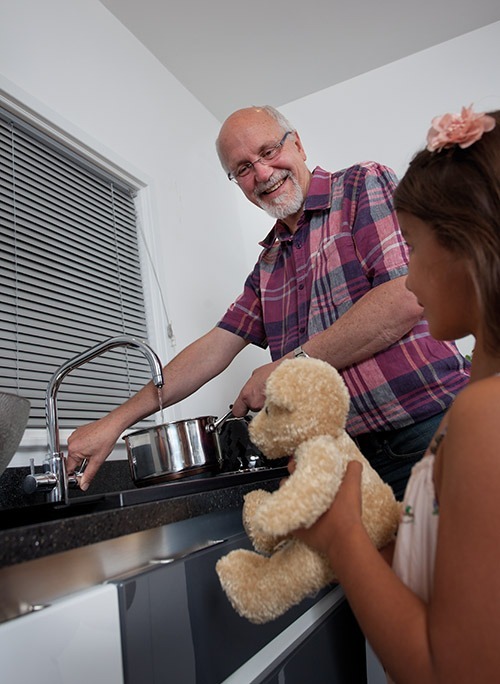 Having hot water instantly available for cooking pasta, vegetables and other foods saves both time and energy as there is no need to heat a pan on the hob before cooking can start. Initial heat up from cold supply is a fast 10 minutes. The compact 2 litre non pressurised tank sits neatly below the sink and the unique heating system means that the tap will dispense 1.7 litres before the temperature drops. The modern quad design is made from the best quality chrome with ceramic disc cartridges that allow water to flow at a touch. The spout rotates through 360° for easy filling of pots and pans. Why should a tap just be a tap? There is enough in everyday life that is mundane. Whether you need a budget-friendly single lever tap for a quick renovation project or if you are creating your once in a lifetime dream kitchen, a tap should be made beautifully and look stunning behind your sink. Create a statement with a designer model like the TC77 or the black TV11 with a pull-out spray. Stay subtle with the TC10 or get professional with the TM30. Whatever look you are going for there is a tap to complete it. There are traditional models in the range like our swan neck and bridge taps that feature additional extras like white or black handle inserts and swivel spouts. Pull-out sprays are increasing popular so we have created options from the large coil style taps that are similar to those found in professional kitchens and smaller, more designer style versions with a pull out hose for convenient and practical rinsing and washing. Choose between brushed nickel or polished chrome on many of the models in the range to match up your kitchen style perfectly. Also notice the range of handles available for practical grip, mixer taps for easy temperature control and levers for retro styling, all tested and designed to our exacting standard. Each tap in the range is featured in this section with detailed line drawings and installation guides to help you and your kitchen fitter create the kitchen workstation that you are after. Not forgetting your CDA guarantee that will give you complete peace of mind when your brand new kitchen is finished and up and running.